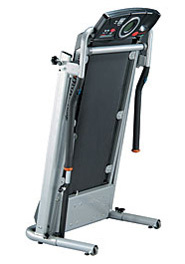 Walking on the Exerpeutic TF900 is an easy, effective way to achieve a regimen of regular exercise! Unlike outdoor walking, treadmill fitness walking has the benefits of shock absorption and the convenience of exercising in your own home. Stay not off course for your exercise goals with the Exerpeutic Fitness walking treadmill, a lower-powered treadmill that’s designed just for walking in the home–perfect for use throughout inclement weather or whenever you get a chance for an exercise break. It features an extra-wide belt that’s designed for safe and effective fitness walking. The ground-level walking surface and wide side rails make it easy to get on and off the treadmill, whilst extra-long safety handles provide a convenient grip for enhanced security and balance. A speed control button is located on the handle bar to make it very easy to raise and lower the speed of the treadmill belt. Walking is still considered one of the crucial beneficial cardiovascular exercises for people of all ages, body types, and fitness levels. As a fundamental form of aerobic training, walking has a large number of physical benefits for the heart, lungs, and circulatory system, whilst also increasing muscle tone and burning fat calories. Treadmills provide a convenient way to ceaselessly exercise in all weather conditions in the comfort and safety of your own home. From beginners just starting an exercise regimen to advanced athletes looking to maintain their fitness level, anyone interested in getting and staying in shape can benefit greatly from regular use of a treadmill. Treadmills allow you to determine the pace, distance, and complexity of the workout based on your needs, all whilst watching television, talking on the telephone, or reading a magazine. Much easier on sensitive joints like the knees and hips, treadmill walking and running surfaces are typically long, padded platforms that allow ample room for a long stride and comfortable, low-affect walk or jog without the harsh contact of a concrete surface. While many different types, styles, and price ranges of treadmills exist, many of them offer unique features like a fold-up design for easy storage, an electronic display monitor showing speed, distance, workout time, incline level, and burned calories, and EKG grip pulses to monitor the heart rate whilst exercising. Regardless of the simple to complex features you may choose, treadmills offer an array of aerobic exercise opportunities that will provide long-lasting beneficial cardiovascular results without a go back and forth to the gym or a jog in the rain.